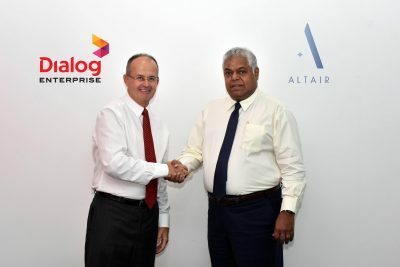 Residents of Altair, the inimitable twin tower residential high-rise nearing completion, are to be provided ‘fibre-to-home’ – a state-of-the-art high-speed fibre connectivity solution – by Dialog Broadband Networks, under an agreement ratified recently. Encompassing high-speed data services of up to 100 gigabits per second (Gbps) for broadband internet, WiFi and Internet Protocol television (IPTV), the facility can also be used for home automation, which enables residents to manage audiovisual (AV), lighting, air conditioning and selected appliances through their smartphones. Additionally, a hosted PABX will support an intercom facility for residents, connecting apartments with the front desk and other common locations such as the gymnasium and recreation centre, spa, building manager and security.